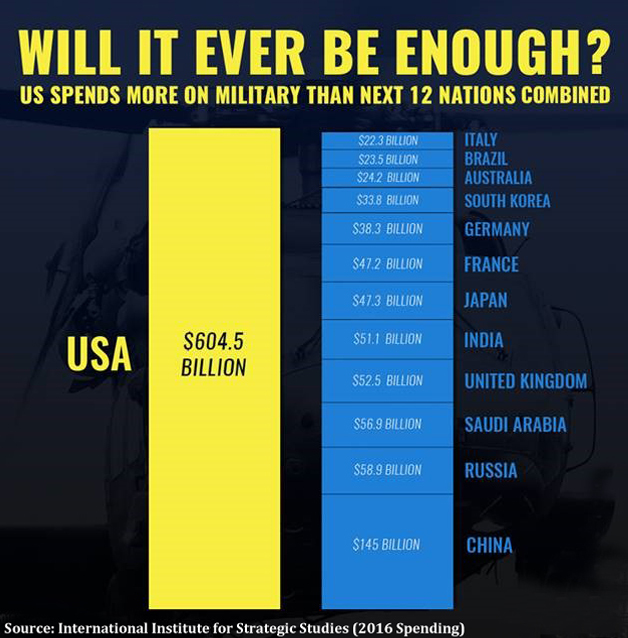 US military spending is nearly equal to combined military spending of the rest of the world. Add in the black budget, veterans both in the system and relying on Social Security when they belong in the veterans system and the debt and interest related to military missions. The spending is massive as the nation is drowning in debt. Veterans For Peace calls for a reduction in the Pentagon budget and an increase in spending to meet human needs at home and abroad. As military veterans from WWII to the current era of conflicts, who have trained for, and in many cases, fought in U.S. wars, we know that current U.S. policies have not only failed to bring peace but are morally bankrupt. This entry was posted in Clarence Kailin Chapter 25 on October 26, 2018 by Brad Geyer.